Curtainsider and platform trailers from Fitzgeralds Vehicle Body Builders are the long-term reliable vehicles for your general cargo business. Our curtainsider bodies are precisely adapted to your transport tasks and offer solid technical and quality benefits for many years. Fitzgeralds’ bodywork is engineered to an exceptionally high standard in both build quality and finish, which ensures consistent performance with minimum maintenance during its many years of service. 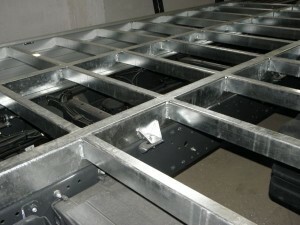 All curtain side bodies meet EWVTA type approval requirements. Built using the latest in CAD technology, all curtainsides are individually designed and manufactured to suit our customers requirements. With options for curtain construction including anti-slash mesh, wear bands and load restraint systems and additional features such as our pre-stressed self supporting roof, fitzgeralds can give you the ultimate in load space versatility. 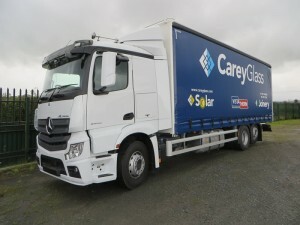 Customers who operate in payload sensitive areas can also choose our lightweight curtainsider. Single-piece aluminium roofing enables a side through-loading height . Floor uniformley designed for point loading. *V* Groove galvanised side lace. One stop shop for all your transport requirements. Fully approved by vehcile manufacurers. Warranty terms available on request.